Well, at least now I know why I was feeling so crummy. I got a phone call yesterday--Monday--saying someone had looked at my x-ray and saw I had pneumonia. (I got my chest x-ray done at about 7;45 Thursday morning) Yup, I was sicker than just flu for all that time. (Good thing I didn't keel over in the meanwhile, huh?) So, now I am taking some lovely antibiotics. Things still do feel like I am swimming, quietly, underwater a lot of the time. #1. It is supposed to really warm up here, right up to freezing, and that is a huge deal for us in winter. Can't wait for a little warm break. #2. 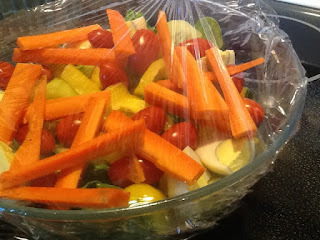 I made this cheerful, bright salad as part of our "leftovers" dinner--like a rainbow on a cold sunny white winter day. Experience Quince from Quince &Co. on Vimeo.